9th June, 2015: Hero Dare 125 is the company’s first 125cc scooter waiting for its launch in India. Showcased at the 2014 Auto Expo, it will come with a 125cc four-stroke engine that claims to deliver an overall good performance. The machine aims to provide power-packed scootering along with a decent fuel economy. Hero Dare 125 is expected to be priced around Rs. 56,000. The scooter is dual toned and will come in two shades: Red and Black. It will compete against Honda Activa 125 and Suzuki Swish 125. Hero seems to be charging the Indian Market with its whole new and attractive range of products. After the Auto Expo, there are bundles of two-wheelers to be launched by the company. Hero Dare, a whole new 125cc scooter is also going to be part of people's life soon. The renowned scooter and motorcycle manufacturer is now heading towards the crown to become the king of the Indian market. Hero Dare is incorporated with a 125cc, forced air-cooled, 4-stroke cylinder, OHC engine that is mated with the CVT system. The engine is configured to churn out the topmost power product of 9.11bhp and the topmost torque value of 9.5Nm. Amazing pick up and top speed will be made available by the scooter. The superior power values complements the bold and electrifying looks it sports. 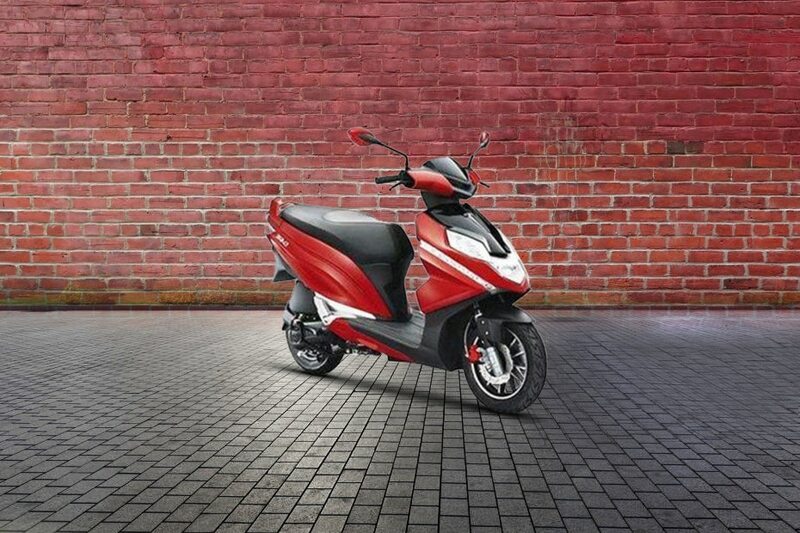 The mileage of the scooter will also be superior, which will get assisted with the 6-liter large fuel tank capacity. Hero Dare is designed to reign the hearts of the population of the country. The overall measured dimensions of the machine are 1820mm x 975mm x 1180mm in terms of length x width x height. Its kerb weight 114kg along with the minimum ground clearance of 155mm. The suspension is coupled with a telescopic hydraulic shock absorbers at the front and single hydraulic shock absorber at the rear. The tyres linked to its body are 90/90 - 12 inch tubeless front with 100/90 - 10 tubeless rear. While, carrying the cast wheels, the tyres are loaded with the 200mm dia hydraulic disk brake with 2-piston calipers at the front and 130mm dia drum brake at the rear. The interesting, visible and trendy traits of Hero Dare are digital instrument panel that includes service due and side stand indicator, dual tone body, body colored brake caliper, LED taillight, aggressive plus chrome plated muffler and body colored rear view mirrors. The amazing part of the scoot is its mobile charging socket and boot light, now that makes it pretty luxurious and premium. Its an appreciable offering by the company that should surely receive some applause. Waiting to hit the Indian shores, Hero is being seen as one of the most good looking scooters for the Indian market. The front profile receives a stylish headlamp unit with daytime running lights and clear lens turn indicators. embedded impressively in the apron. Furthermore, it also gets a classy dual-tone treatment that look really fascinating and enhances the appeal of the scooter. The front cowl is also dual-toned with a black coloured visor fitted in-between. Moving towards the rear, it also gets a sporty textured seat that offers an optimum comfort to the rider and pillion. The aggressively rising body profile of the scooter makes it look even more sporty and robust and ends up with a body coloured grab rail. Hero Dare gets a stylish full LED tail lamp unit that comes integrated with clear lens turning blinkers. Hero Dare has body dimensions of 1,820mm x 975mm x 1,180mm (LxWxH) with a minimum ground clearance of 155mm that offers superior stability. It has been fitted with a 6 liter fuel tank that gives a commendable range after refuelling. The instrument console of the scooter is fully digital that comprises of a speedometer, tripmeter and fuel gauge along with service reminder and side stand indicators. Other convenient features include a mobile charging point and a boot light. The 125cc scooter runs on 90/90 – 12 front and 100/90 – 10 rear tubeless tyres that are mounted over stylish dual-tone alloy wheels. It retards with the help of 200mm Hydraulic Disk Brake with twin-pistons caliper upfront and 130mm internal expanding shoe type drum brake at the rear end. The vehicle avails a stress-free and comfortable ride as it comes assisted with telescopic hydraulic shock absorbers at the front and a monoshock at the rear. Hero Dare 125 comes with a powerful front 200mm disc brake as standard that offers a commendable stopping power. Furthermore, it has been equipped with bright 12V-35/35W headlight that delivers a steady beam of light even in low rpm conditions. Besides this, it also sports daytime running light that avoids chances of any mishap. A pass-by switch has also been added to the scooter that ensures easy and safe overtakings. A side stand indicator has also been integrated into the instrument cluster to prevent any mishap. These bunch of elements make it a trustworthy 125cc offering for the Indian market.